Most of the desktops I deal with are so big that they can barely fit underneath your desk--let alone on top of it. 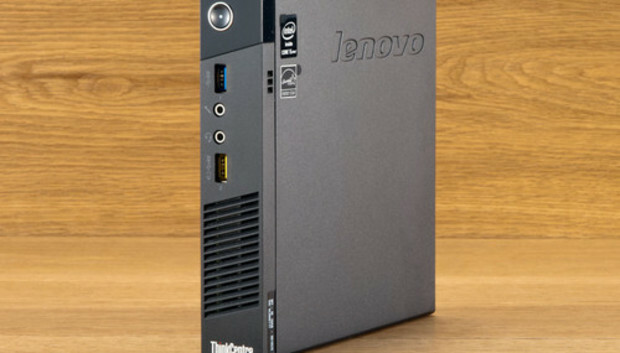 But Lenovo's ThinkCentre M93p Tiny lives up (down?) to its name: This small-form-factor PC measures 7 inches tall, 7.2 inches wide, and 1.35 inches thick, which makes it smaller and more portable than some laptops. The Tiny packs a fourth-generation Intel Haswell processor into a compact, rugged chassis that weighs less than three pounds (sans power supply and accessories). Lenovo says the machine complies with 8 Mil-Spec criteria: dust, shock, temperature extremes, humidity, and impact. The machine is ostensibly designed for business users--it has a zero footprint if you mount it to the back of display, on a wall, or underneath a work surface (the plug in a wired USB keyboard, and you can power-on the PC by pressing Alt + P). Consumers can also create their own all-in-one this way, or they can stash it in an entertainment center and use it as a home theater PC, like Intel's Next Unit of Computing (NUC) . Unlike the NUC, this machine is also rugged enough to serve duty in a warehouse or on a factory floor. The M93p Tiny isn't super-cheap: Our review model costs $750 as configured. This gets you an Intel Core i5-4570T processor (with Intel's vPro management technology), 4GB of DDR3/1600 memory, integrated graphics, and a 500GB platter hard drive. You also get Windows 7 Pro, an integrated 2x2 Wi-Fi adapter, and a USB keyboard and mouse. Our version of the Tiny doesn't come with an optical drive (something you may or may not want for your home theater setup), but you can add a slim external DVD Recordable drive for $75. Performance-wise, the Tiny is good but not great. It scored a 136 in our WorldBench 8.1 benchmark tests, which means it's 36 percent faster than our reference machine (an Acer Aspire U A5600U-UB13 with a third-gen Intel Core i5 processor). Compared to the most recent NUC, however, the Tiny falls quite a bit short. The NUC Kit D54250WYK scores 241 on WorldBench 8.1, thanks in part to its SSD (the Tiny has a conventional platter hard drive). The Tiny also falls behind the NUC in other tests. It's slower to start up (taking 24.6 seconds instead of the NUC's 20.9 seconds), uses more power while working (3.5 vs. 1.6 watts) and while idle (12.3 vs. 7.7 watts), but it's still a fairly speedy, low-power PC when compared to tower desktops. Take the Maingear Shift Super Stock Z87, for example, a powerful gaming desktop whose working power usage is 20.4 watts and whose idle power usage is 106.7. The Tiny does fairly well in our graphics tests. It's no gaming powerhouse, but you'll be able to play plenty of average-quality games on this machine if you so desire. In our Dirt Showdown test (low-quality settings, 1024 by 768 pixel resolution), the Tiny managed a playable 43.8 frames per second. In Bioshock Infinite (low-quality settings, 1024 by 768 pixel resolution), the Tiny managed 26.4 fps. By comparison, the NUC managed 29.7 fps in the same test. Less than 30 fps isn't exactly playable, but it's still pretty good for the casual gamer. The M93p Tiny has plenty of hook-ups for your home theater system, but HDMI isn't a standard feature (you can specify one when you place your order, or you can buy a $10 DisplayPort-to-HDMI adapter). On the front of the compact chassis you'll find the power button, one USB 3.0 port, microphone and headphone jacks, and an "always-on" USB 2.0 port for charging mobile devices. On the back of the PC, you'll find another three USB 3.0 ports, two DisplayPort outputs, VGA out, gigabit Ethernet, and a Wi-Fi antenna. Lenovo's ThinkCentre M93p Tiny is aptly named, but it will be of more interest to businesses than consumers. If you're looking for a small HTPC, Intel's even smaller NUC might be a better choice (it has a Mini HDMI port). The Tiny's rugged design and VESA mounting options are just the ticket for a business to deploy to an office full of employees.